Law enforcement officials in North Carolina are investigating claims by a Los Angeles animal rights group that turkeys being fattened up for Thanksgiving were mistreated at farms run by the Butterball company. The Lenoir County Sheriff’s Office said it is taking seriously an undercover video shot by the group Mercy for Animals that appears to show workers at the farm kicking and throwing the live turkeys in order to get them into cages before they are sent to the slaughterhouse. “We found people kicking and stomping on birds, and leaving birds to suffer from untreated illnesses,” said Matt Rice, director of investigations for Mercy for Animals. In one scene, a worker explains that maggots live in open sores on some of the birds. “We started an investigation after they brought us the information,” said Lenoir County Sheriff’s Chief Deputy Chris Hill. Sheriff’s investigators met with representatives of Mercy for Animals about two weeks ago, Hill said. Investigators viewed the video and are also reviewing documents provided by the group, he said. When the investigation is complete, the sheriff’s office will turn the results over to the Lenoir County District Attorney, who will decide if the actions meet the criteria for felony or misdemeanor cruelty to animals, Hill said. Matt Rice, head of investigations for Mercy for Animals, said the video was shot last month at Butterball facilities in four North Carolina counties, including one in Lenoir County. Butterball said it is also investigating the claims. Last year, several of its employees were convicted of animal cruelty after a Mercy for Animals action at another North Carolina farm. "Any employee found to have violated our animal care and well-being guidelines, as well as any employee who witnessed abuse and failed to report it, will be terminated," said Butterball spokeswoman Stephanie Llorente. The company uses humane treatment guidelines developed by the National Turkey Federation, and has a "zero tolerance" policy toward animal abuse, she said. Mercy for Animals, meanwhile, on Monday began airing a series of cable television commercials in Southern California, aimed at telling consumers about its allegations of abuse at Butterball. 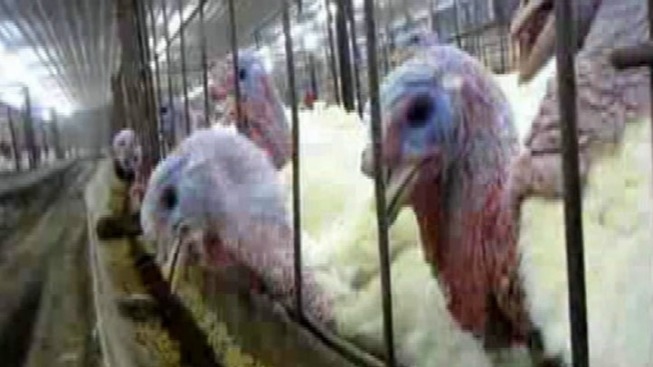 “Before you serve your family a Butterball turkey this Thanksgiving, you should know that Butterball employees have been found guilty of cruelty to animals,” the commercial says. The 30-second spot is running through Nov. 25 on Time Warner cable channels including MTV, MTV2, Food TV and Animal Planet. The group, which is urging consumers to serve vegetarian meals for Thanksgiving, is also trying to convince legislators in North Carolina and other places where poultry farms are concentrated to adopt stricter animal cruelty laws.